Windows 10 comes out today, and the price is really, really right for everyone that currently has Windows 7 or Windows 8 (or 8.1). The price is zero dollars. Yes, Microsoft is giving it away for free if you currently have an authorized (legal) version of either Windows 7 or Windows 8 running on your PC. If you have not yet reserved your upgrade, you can go to Microsoft to do that right now. But, should you do that? The question is: Windows 10 – run towards or run away? If you have Windows 8 or Windows 8.1 (or as I call it, Windows Vista: The Sequel), you should upgrade as soon as possible, and I will be at the front of the line to do that myself. In fact, by the time this post is published, I will have Windows 10 on all three of my computers and will be a happier person overall. I’m counting on it. 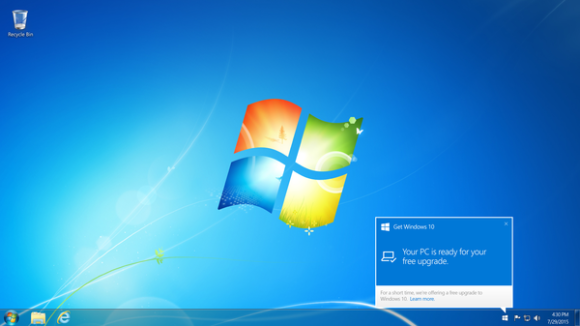 If you’re using the just-about-bulletproof Windows 7, maybe you should wait a month or so. You have up to a year to upgrade for free, and there will be a bug or two, so why not hang back and let Microsoft fix everything before you install Windows 10 on your machine? My personal advice aside, if you haven’t been following the development of Windows 10, the new Windows OS (operating system) is getting very positive reviews by every tech reviewer that’s used it so far. And unlike previous Windows operating systems, Windows 10 is designed to operate on desktops, laptops, tablets and phones (Windows Phones, that is – currently about 3.5% of the smartphone market) seamlessly. Personal or business, it appears that Windows got this OS right, like they got Windows XP and Windows 7 right, and not a moment too soon. If you’ve been using Windows 8, there is no need for me to elaborate at all. Go forth and be happy with your Windows OS!